Are We There Yet?? 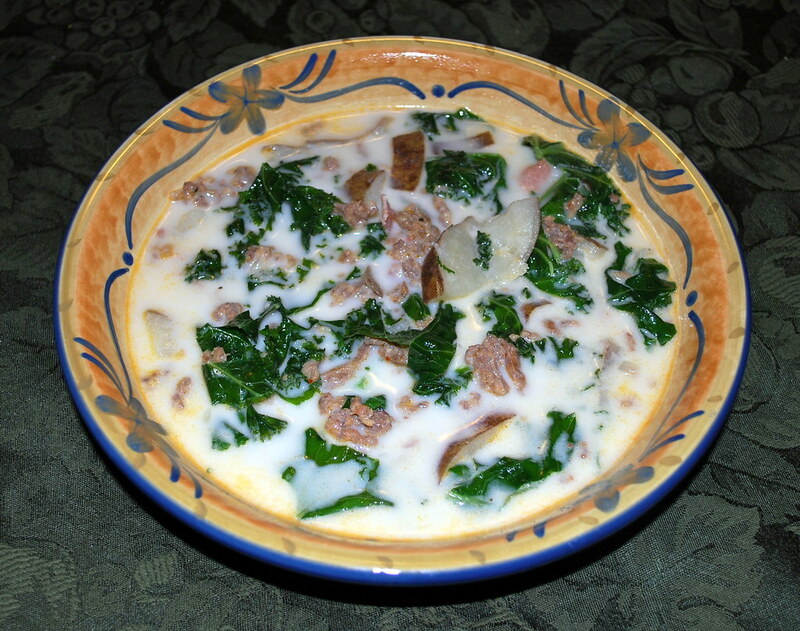 : Zuppa Toscana - The At Home Version! Last Saturday afternoon the girls and I went to The Olive Garden for lunch and - for probably the 12th time - I said that if I could just find a recipe for it, I'd make my favorite Zuppa Toscana soup at home so that we could have it more often. Amanda likes it just as much as I do so I finally went in search of a recipe online. Turns out there were quite a few from which to choose but none of them sounded 'quite right' as I couldn't for the life of me remember there being bacon in the soup. However, every recipe I looked at called for bacon in varying amounts so I figured that had to be right, right? I ended up using a little of this and a little of that from each of the recipes that I found and eventually ended up with my own recipe of sorts. When I made the soup I doubled the recipe as the way I look at it you can never have enough Zuppa Toscana and I knew Amanda would be looking for leftovers if it came out as well as the soup we love at The Olive Garden. Cook the Italian sausage, crumbling it as you go (I used the non-link variety); drain and set aside. Lightly saute the onion in the same pan you just cooked the sausage in until soft. In a large pot, add water, chicken broth, garlic, sauteed onions, and potatoes; cook over medium heat until potatoes are tender. Add cooked sausage and cooked diced bacon to the pot and let simmer for another ten minutes. Add kale and heavy cream to pot; season with salt & pepper; heat for about 5 to 10 minutes; serve to rave reviews! This was my finished product and Amanda declared it to be exactly like the soup at The Olive Garden; the only things missing were the grated Romano cheese on top and the breadsticks! Because Amanda dislikes onions almost as much as she dislikes needles, after sauteing the onions I put them through my mini-food processor so Amanda couldn't see them floating in her soup and she never even knew they were there until I told her after she'd eaten her first bowl-full! *pretty darned good for a first try! Oh, baby! I've got to try this! I love all The Olive Garden soups! you know what i would do? mash one potato to thicken it a bit. it looks wonderful! Oh boy... dig in!!! Great job, Linda!! very yum! I've never had the Olive Garden version...but I might have to try yours! That looks delish! Why Can't I find dishes like this? I've never heard of it before but it looks and sounds deeeelish! I'm going to try to make it, just as soon as we have another chilly day. Ok, now I gotta wipe off the drool from my desk! LOL. you think i could substitute spinach for the kale? You gotta have onions in soups! I'd finely chop celery and add it too, to the consternation of a few people I know...actually, hot sausage here is fine, the cream should add a bit of sweetness to the heat - although to a youngster not used to spice, it might not seem so! Soups are one of my favorite meals and one of the few things I enjoy cooking. Yours looks amazing. I just ate at Olive Garden Saturday for dinner. Love their food. I'm making this right this very minute... I'm adding a tad of celery and some carrot to mine. I'm also using some mild italian sausage... and lightening it with half and half instead of heavy cream.